Some political advertising is good. The other 99 percent is junk. Telling you which is which is my job. I make political ads. Good ones. For big, national races. And I'm here to tell it like it is. Buckle up kids, it's gonna be a bumpy ride. Some people think Washington is out of touch, but it looks like Senate candidate Deb Fischer thinks the whole state is out of focus. Her new spot has such a big, soft vignette around the edge that it made us feel kinda drunk. And we're not drunk. Honest. 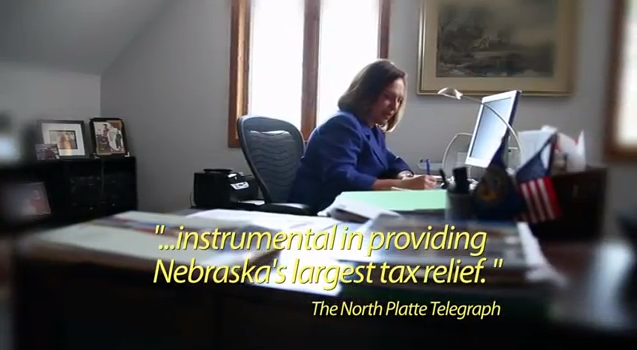 Click here to watch Deb Fischer. Can charts work on TV? Eric Hovde says sure. Charts on TV? Bor-ring. Politician climbing up a chart while delivering his message? Not bad. Eric Hovde's first ad in Wisconsin does a nice job of showing off Hovde (a nice comparison to the less-TV-friendly Tommy Thompson) and driving home some good points. We're sure it cost a pretty penny, but it was worth it. 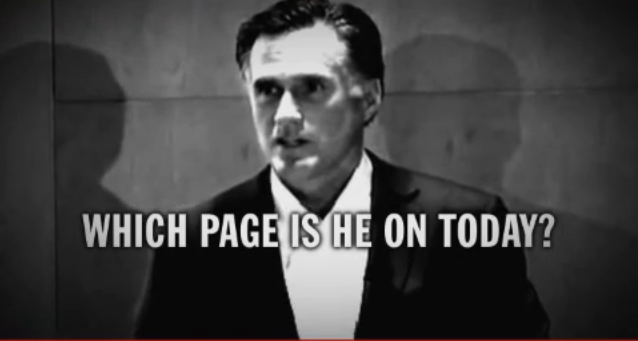 The first ad of the 2012 Presidential campaign is, wait for it, an attack ad. 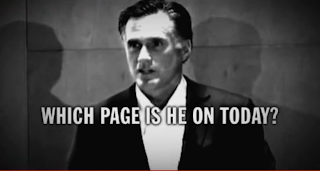 In this particularly uninspiring piece of creative, Priorities USA uses Newt Gingrich, Paul Ryan and Nikki Haley to go after Mitt Romney (I know, it didn't make sense to me, either) with the tested-in-NY26 Medicare hit. We hope this doesn't portend a 2012 of cheaply produced, poorly written, I-made-it-on-my-laptop-while-sitting-in-the-LaGuardia-Admirals-Club ads. But I think it does. Click here to sit through "Pages"
Oil! Black gold! Staten Island tea! According to this poster (spotted by the world famous Gregg Keller), everybody in Staten Island is about to be filthy rich. 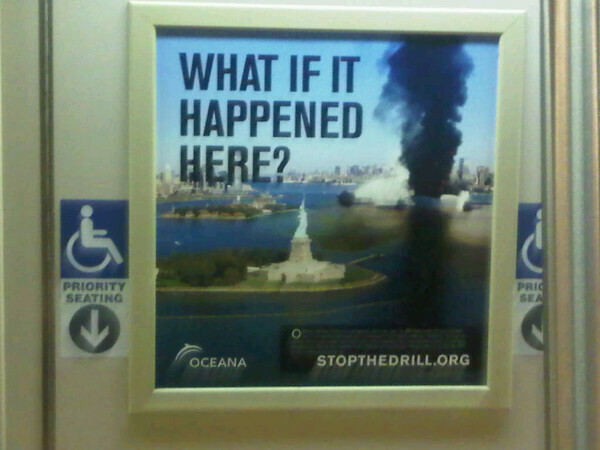 Not only does this poster miss the mark, it's an attempt to co-opt 9/11 imagery and feelings to push an agenda. That's not right. Thanks again to "Hollywood" Gregg Keller. Have you seen a great (or bad) poster? You have a camera phone. Shoot it and send it in. Wouldn't it be great if you could just buy stock footage and stick your own face in it? 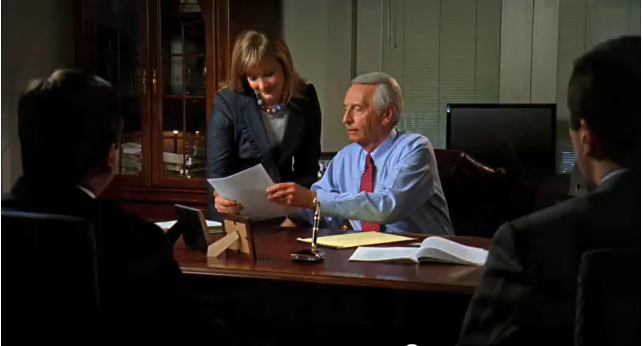 That's pretty much what Kentucky's Steve Beshear is doing here. We see Steve on a park bench, Steve in a factory, Steve behind a desk and, wait for it, Steve in a diner. Even Beshear's tagline, Tested Trusted Tough, has the smell of old alliterative cheese. Click here to watch "Bio." But, trust us, you've seen it all before. The NY-26 special election, which goes to the polls Tuesday, is a political train wreck. (Naturally, we couldn't help but look.) It features Jack Davis, a Democrat running on the Tea Party line on the ballot. Flim-flam or genius? Doesn't really matter because he's going to lose. Trouble is, he'll probably take the Republican candidate with him. At least he gaves us this gem of an ad that Politico called the most depressing campaign ad ever. Dad lost his job. Mom needs chemotherapy. Sis is depressed. Brother is, well, he's just kind of a prop. Click here to watch Jack Davis' "Chemotherapy"
Wasting money is some of the best creative fodder around. In this lavish ad for Citizens Against Government Waste, the Chinese become the target. Nice concept, well-produced, nicely derisive and reminscent of Apple's "1984" without directly stealing from it. I thought the giant CG Chinese flag could have looked better, but I'm nit picking. Earlier in the cycle, Bankrupting America went up with this simple ad showing how, not the Chinese, but our own government is spending us into the ground. Literally. Full disclosure: this is spot our talented team produced. Click here to watch CAGW "Chinese Professor"
Click here to watch Bankrupting America's "Stop Digging"
This had to be a tough call. 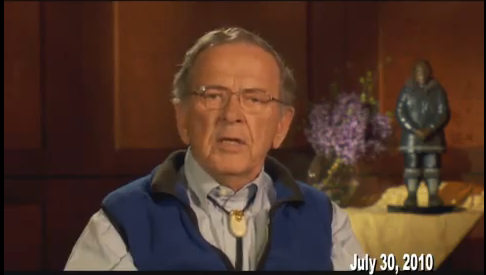 The Murkowski campaign cuts an endorsement spot with the late Sen. Ted Stevens. We all know what happened next. With her campaign in major trouble, she really needs that endorsement. No doubt, Senator Stevens would have wanted them to use the ad, but it's still a tricky bit of business. Here, the Murkowski campaign plays it smart and errs on the side of respect having Sen. Stevens' daughter introduce the ad, give her blessing and even appear with Murkowski. Will this turn the tide and get people to write in Murkowski? Probably not, but it's Alaska, so you never know. It won't win any awards for creativity, but they handled this right. Click here to watch "Ted Stevens"
Vitter is hitting Charlie Melancon hard with this over-the-top "Immigrants Welcome" spot. These are always tricky to do, because you want to get the point across without insulting anyone but the opposing candidate. 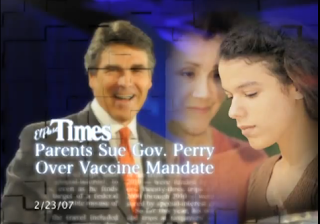 In this case, Team Vitter goes with ridiculous, cartoony visuals that really work. You won't miss this spot on TV. Click here to watch "Welcome Prize"
We've ranted and raved about the lack of production values in political ads. This time we won't. 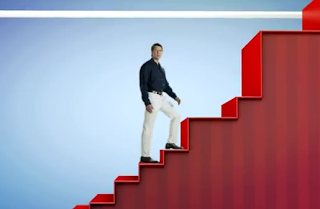 Because Rand Paul has taught us you can still make a dreary commercial with nice production values. We want to like this spot and, on paper, it has everything. Quality shooting, tasteful editing, good props, what could be wrong? It's only half an idea. A Barack Obama impersonator talking about how much he wants Jack Conway in the Senate. Good start, but it doesn't go anywhere from there. No gag, no twist, no great line for people to talk about over coffee in the morning. Looks good, but it's a missed opportunity. Click here to watch "Stamp of Approval"
Let's be honest, Christine O'Donnell has made some boneheaded moves. One smart move she made was to hire a top flight media consultant. In this straight-to-camera confessional Christine comes off as earnest, honest and brave enough to present a contrast to the whirlwind of noise around her. We still think she has a snowball's chance in hell of winning this thing, but this is a simple, well-done ad that hits all the right buttons. 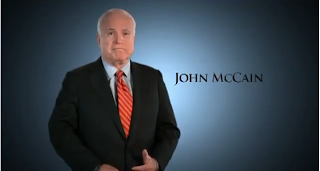 Click here to watch "You"
Love him or hate him, when John McCain is on he can really deliver. Here he is doing just that for Bill Flores. We like the closer shot of Bill Flores speaking to workers, but the shot of him working at his desk late at night? Let's aim a little higher folks. Click here to watch "Texans Deserve Better"
Joe DioGuardi has a problem. 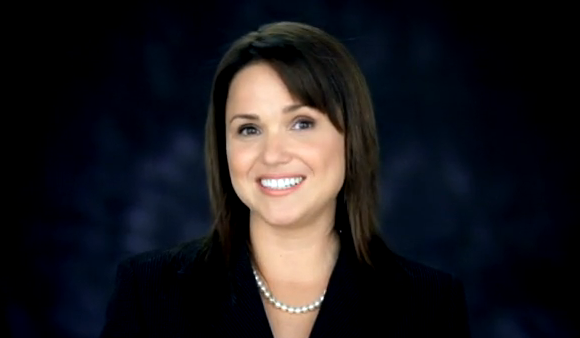 His opponent is a very good looking woman. 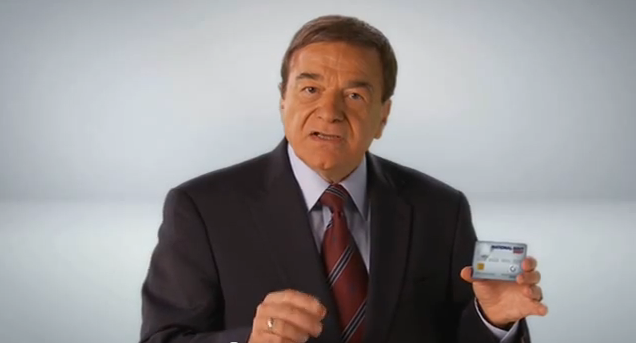 He looks like Joe Pesci. The solution? In this case, a bit of trickery. This spot features Joe standing on a white cyc holding a green screen credit card that magically changes as he swipes his finger across it. To be honest, his opponent is a lot easier on the eyes, but this spot's pretty well done. Click here to watch "Credit Card"
Ever seen two guys in those big puffy fake sumo wrestler suits go at it? Kind of funny for a couple of minutes, then just sad and embarrassing. That pretty well sums up the Vitter-Melancon race. 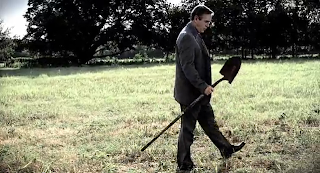 Vitter has trotted out a series of ho-hum ads including a spot that used one of my favorite horrible political ad cliches, "Charlie Melancon, he's not on our side." Oh yeah, it has a bobblehead in it, too. Now Melancon, shooting the best (and probably) last bullet in his gun, Charlie has produced a 2:00 commercial laying out (pun intended) the Vitter prostitution story. But this is no ordinary 2:00 commercial, it's repackaged as a quasi news show. The big moment comes at 1:01 where they show someone who wants their identity protected. 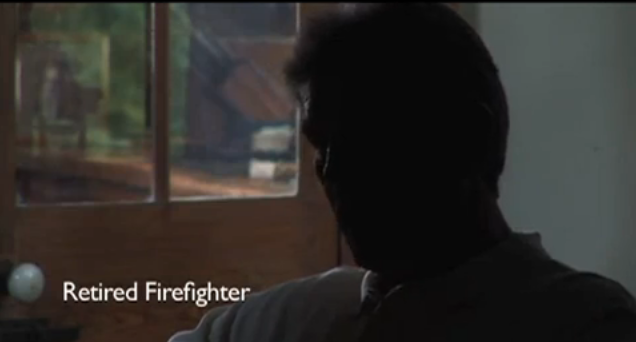 We see the silhouette of someone identified as "Retired Firefighter" who says, "if someone writes the laws, they should abide by the laws." Explosive! The "re-enactment" scene is pretty funny, too. I give them credit for trying to do something interesting, but it's probably best left to professionals. Click here to watch "Forgotten"
It's big news that the DGA is playing in the Texas Governor's Race. Especially when you consider that running TV in the Lone Star State is going to cost them somewhere north of $600,000 a week. But if you're going to run millions of dollars in paid media, shouldn't you spend more than hundreds of dollars on the production of your spot. The visuals are homemade, the image is mushy and the entire spot looks as if they spent almost as much as ten minutes in deep thought about it. The messaging has the potential to hit hard, but the technique puts the "hack" in "hackneyed." If this is their best shot, Rick Perry has nothing to worry about. Click here to watch "Cracks"
It's negative ad season. I get that. Trust me when I tell you a good negative ad should be clear and simple. It can be funny, it can be fancy, but it has to make sense right away. Apparently Alan Grayson disagrees with me. In this attack ad against Daniel Webster, they use a piece of video that would, no doubt, drive Grayson's base crazy. But it's so chopped up, stomped on and convoluted that I could barely make it to the 30 second mark. 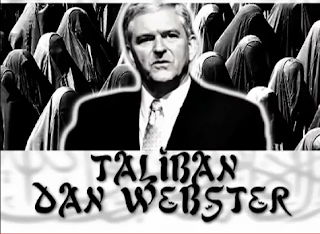 But I'm glad I did, because at the end Grayson calls Daniel Webster a Taliban. That made my day. Hold on tight and watch "Taliban"